You adore your J12 watch, and you would love to have a stronger “Chanel touch”… then there is nothing better than having Coco herself telling you what time it is! Launched in 2000, the J12 was the first timepiece to use high-tech ceramic as a precious material. Seventeen years later, Chanel continues to pay tribute to this now iconic watch. Among limited editions and exceptional pieces, the new Mademoiselle J12 brings Coco silhouette to life into the dial, for a new, playful and humorous interpretation. Chanel Watches. 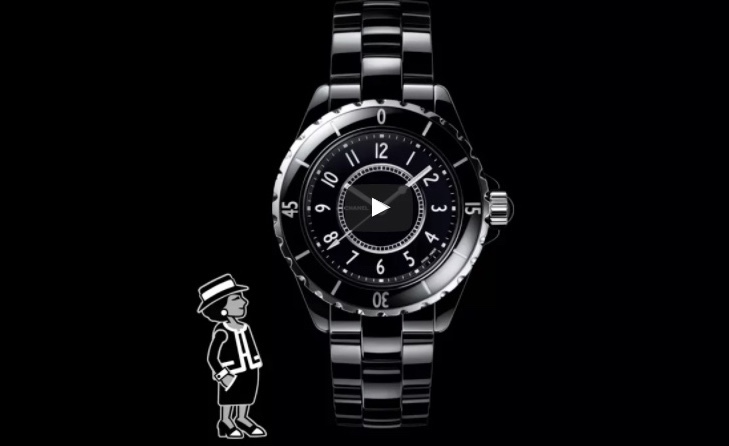 Mademoiselle J12, in black high-tech ceramic. First presented at Baselworld this year, the new Mademoiselle J12 is a limited edition of 555 pieces (easy to imagine the symbolic value of the number 5 here). It comes in black or white high-tech ceramic (a high technology and highly scratch-resistant material, and steel), with a 38 mm case with unidirectional bezel. The black or white lacquered dial is protected by a sapphire glass plate, that has Mademoiselle Chanel’s illustration printed on it, and affixed onto the black or white lacquered dial – rhodium-plated and black, white and silver lacquered hands in the design of Coco’s arms. The bracelet is also in black or white high-tech ceramic with steel triple folding buckle, and the crown is screw-down with a black or white ceramic cabochon. Chanel Watches. Mademoiselle J12 – white high-tech ceramic. The movement is mechanical self-winding, with 42 hours of power reserve, and it is water resistant to 200 meters. Indeed! I totally agree with you!